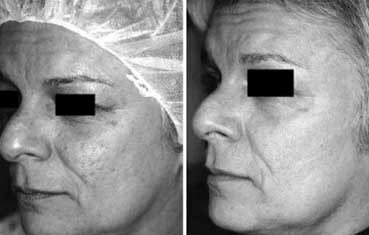 Acne scar treatment: This woman's dermatologist treated her acne scars (left) with acne scar surgery and laser therapy. At 3 months (right), she has noticeable improvement. If acne scars bother you, safe and effective treatment is available. Treatment can diminish acne scars that cause depressions in the skin. Treatment can also safely reduce raised acne scars. Many treatments are available. Treatments include laser treatments, minor skin surgeries, chemical peels, and fillers. A dermatologist or a dermatologic surgeon can perform these treatments in a medical office. As we age, acne scars often become more noticeable because our skin loses collagen.The key to effective treatment is to select the best one for each scar type. For example, a patient who has some deep scars may benefit from getting a filler, which adds volume to the skin. This may be followed by laser treatments. Before getting treatment for acne scars, it is important to clear your acne. New acne breakouts can lead to new acne scars. Having acne also means that your skin is inflamed. Inflammation reduces the effectiveness of treatment for acne scars. To obtain the best results, a dermatologist first examines your skin. After the exam, some patients are surprised to learn that their acne scars are actually a different skin problem. Image used with permission of Journal of the American Academy of Dermatology. J Am Acad Dermatol 2001;45:116. Jacob CI et al. “Acne scarring: A classification system and review of treatment options.” J Am Acad Dermatol 2001;45:109-17. Riveria AE. “Acne scarring: A review and current treatment modalities.” J Am Acad Dermatol 2008;59:659-76. Depressed: Most acne scars cause depressions or pits in the skin. Images of acne scars used with permission of Journal of the American Academy of Dermatology. J Am Acad Dermatol 2001;45:109-17 and 2013;68:834-53. Images of dark spots used with permission of Journal of the American Academy of Dermatology. J Am Acad Dermatol 2002;46(issue 2; sup 2):S98-S106. Thiboutot, D et al. “New insights into the management of acne: An update from the Global Alliance to Improve Outcomes in Acne Group.” J Am Acad Dermatol 2009;60:5(sup. 1) S1-S50. Has inflammatory (swollen, reddish, and painful) acne, such as acne cysts and nodules. This type of acne tends to penetrate deep into the skin, which damages the skin. Delays or does not treat inflammatory acne. The longer a person has inflammatory acne, the greater the risk of scarring. Picks, squeezes, or pops acne. This increases inflammation, which increases the risk of scarring. Has a blood relative who developed acne scars. Genes play a large role. Although we know what increases a person’s risk of developing acne scars, it is not possible to predict who will develop acne scars. Even people who have all the risk factors may not scar. It is, however, possible to prevent acne scars with effective acne treatment. Waiting to treat acne until it becomes severe can lead to extensive scarring. When acne breakouts penetrate the skin deeply, they damage the skin and the tissue beneath it. As the acne clears, the body tries to repair this damage. During the healing process, the body produces collagen — a substance that gives the skin support. If the body produces too little or too much collagen, you will see a scar. The type of scar depends on how much collagen your body makes. Depressed acne scars: If the body produces too little collagen, depressions or pits form as the skin heals. Raised acne scars: Sometimes the body produces too much collagen as it tries to heal the skin and underlying tissue. When this happens, a person develops a raised acne scar. This type of acne scar is more common in people who have skin of color like African Americans, Hispanics, and Asians. Even when we do our best to prevent acne scars, some people scar. There are many treatment options, which can significantly diminish depressed and raised acne scars. Safe and effective treatment for acne scars begins with a consultation. During the consultation, a dermatologist will examine your skin, playing close attention to your scars. A dermatologist will also ask you some essential questions. Why do I want to treat my acne scars? Do I often wish that I could get rid of my acne scars? Do I feel that my scars limit my opportunities to date, get a job, advance my career, or perform well in school? Am I less social now than before I had acne scars? How do I want to look after treatment? Some people want less noticeable scars. Others wish to eliminate wavy skin texture. What can I afford to spend on treatment? Medical insurance does not cover the cost. How much downtime can I afford? How much time will I devote to getting treatment and caring for my skin? Your answer will help determine which treatments will be best for you. How do dermatologists treat acne scars? If you and your dermatologist believe that treatment is right for you, your dermatologist will create a treatment plan tailored to your needs. In creating this plan, your dermatologist will consider many things, including scar types and where the scars appear on your body. If you have taken isotretinoin to treat acne, be sure to tell your dermatologist BEFORE treatment for acne scars begins. To obtain the best results, your dermatologist may recommend more than one treatment. For example, if you have a deep boxcar scar (often looks like a large pore), laser therapy and a type of acne scar surgery called “subcision” may be necessary to give you the results you want. The following tables list the treatments that a dermatologist may use. Your dermatologist relies on in-depth medical knowledge to determine which treatments are best for you. Acne scar surgery: This sounds scarier than it is. Dermatologists often perform this minor surgery to treat very noticeable acne scars. The goal is to create a less-noticeable scar. The remaining scar should fade with time. To perform acne scar surgery, a dermatologist may lift the scar. Bringing a scar closer to the surface of the skin tends to make it less noticeable. Another type of acne scar surgery involves breaking up scar tissue. A dermatologist or dermatologic surgeon can safely perform acne scar surgery in a medical office. Patients remain awake but numb so that they do not feel pain. Best for: Treating a few depressed scars. Resurfacing procedures: When a patient wants to diminish the appearance of widespread acne scarring, a dermatologist may recommend a resurfacing procedure. Resurfacing removes layers of skin, which allows the body to produce new skin cells. Resurfacing works well for treating acne scars that are nearly flat (not too deep). Even dermabrasion, which removes the top layers of skin and some of the middle layers, cannot effectively treat deep acne scars. Best for: Depressed acne scars that are not deep, useful for contouring scar edges to make scars less noticeable. Deep scars often require skin surgery and resurfacing. Skin fillers: Dermatologists use fillers to safely and effectively plump depressed acne scars. A dermatologist may fill acne scars with collagen, the patient’s own fat, or another substance. Many fillers give us temporary results, which last between 6 and 18 months. Some fillers are permanent. Both temporary and permanent fillers have unique pros and cons. If this is a treatment option for you, be sure to ask your dermatologist about the pros and cons of the recommended filler. Best for: Treating a few depressed scars, but not icepick scars. Skin tightening: This is a newer treatment and tends to be more affordable. This treatment is safe for all skin colors. Dermatologists often use a technology called radiofrequency to tighten the skin. As the skin tightens, depressed acne scars become less noticeable. Radiofrequency requires repeat appointments. Most patients return once a month for 4 months. After a radiofrequency treatment, many patients say they feel a burning sensation for about 1 hour and their skin has a pinkish color for 2 to 3 days. Radiofrequency treatments require some at-home care. For at least one week after each treatment, you will need to apply sunscreen every morning and a moisturizing cream at night. Dermatologists recommend wearing a sunscreen that offers UVA/UVB protection, an SPF of 30 or greater, and water resistance. Best for: Depressed acne scars. Sometimes, skin tightening effectively treats deep icepick and boxcar scars. Collagen-induction therapy: Also known as “needling” or “micro-needling,” this treatment encourages your body to make more collagen. To perform this procedure, a dermatologist moves a sterile, handheld needle-studded roller across the depressed acne scars. This punctures your skin. As your skin heals, it produces collagen. It takes time to see the results, sometimes as long as 9 months. Most people, however, notice gradual changes before 9 months. Many patients require between 3 and 6 treatments and return every 2 to 6 weeks for a treatment. After each treatment, you may have some swelling and possibly bruising. These side effects usually clear within 4 to 5 days. You will need to follow a skin care plan while undergoing treatment. Research shows that this is a safe treatment for people of all skin colors. Best for: Widespread depressed acne scars. Not a treatment for raised acne scars, which form when the body produces too much collagen. Electrodesiccation: This treatment uses electric probes to heat the tissue, which causes the tissue to die. This treatment may be part of a treatment plan for boxcar acne scars. Electrodesiccation by itself is not an effective treatment for acne scars. Best for: Shaping or reducing the edges of boxcar scars. Injections: Your dermatologist may recommend injecting medicine directly into the scars. This can soften and flatten raised, thick scars. Getting the best results often requires repeat visits. These injections are usually given once every few weeks. How often you will need to return for treatment depends on the scar and many other considerations. You may need to return once every 2 to 6 weeks for a while. Many patients receive injections of corticosteroids. A chemotherapy medicine known as fluorouracil (5-FU) can also be effective in treating raised acne scars. Some scars respond best when injections of both 5-FU and corticosteroids are used. Interferon, which is also used to treat cancer, can be effective. Our bodies naturally produce interferon. If the scar does not respond (or stops responding) after you receive the 4th injection, acne scar surgery may be recommended. Best for: Painful, raised scars. Acne scar surgery: Dermatologists perform acne scar surgery to reduce raised acne scars. This surgery can be performed in a dermatologist’s office. To obtain the best results, acne scar surgery is often followed by another treatment. Acne scar surgery, followed by injections: After surgery, dermatologists often treat raised scars with injections of corticosteroids, 5-FU, or interferon. Combining acne scar surgery with these shots remains one of the most effective treatments for raised scars. Most patients receive injections once a month for a few months. Acne scar surgery, followed by radiation: Studies show that radiation can prevent raised scars from returning after acne scar surgery. Due to the potential for radiation treatments to cause problems years or decades later, some doctors do not recommend radiation treatment. Best for: Raised scars that need more than injections. Laser therapy: Lasers and other light treatments can treat raised scars safely and effectively. Treatment with a pulsed dye laser (PDL) can help reduce the itch and pain, diminish color, and flatten a raised scar. For people with lighter skin, intense pulsed light (IPL) also may be a treatment option. Best for: All types of acne scars. Cryosurgery: This treatment freezes the scar tissue. Freezing the tissue causes it to die and gradually fall off. To improve the results, dermatologists recommend a series of cryotherapy sessions and corticosteroid injections. This combination often produces better results. The main drawback is that cryotherapy can cause permanent light spots to form on the treated skin. Best for: It can effectively diminish raised scars in people who have lighter skin. Not recommended for skin of color. Scar creams and gels, silicone (dressings and bandages): Often available without a prescription, these can be used at home to treat raised scars. These products can help reduce the itch and discomfort as well as shrink, flatten, and fade raised scars. Silicone dressings and bandages can be especially helpful. Although no one knows for sure how these work, one possibility is that silicone helps hydrate the skin. This may reduce the itch and pain as well as make the skin more flexible. To be effective, these products must be used continuously. This can be difficult, especially for scars on the face. Many people are willing to do this because these treatments have little risk of side effects. Even so, with continuous use, some people develop itchy, irritated skin. This usually clears when the person stops using the product. Best for: Reducing scar size and discomfort. None is likely to eliminate a raised scar. What outcome can a person with acne scars expect? Most treatments can reduce the size and visibility of acne scars. With time, many of the treated acne scars fade, making them barely noticeable. Your results depend almost entirely on the knowledge and skill of the person performing the treatment. Dermatologists and dermatologic surgeons perform these procedures frequently, so they have the skills and experience needed to perform these procedures safely and effectively. While dermatologists offer safe and effective treatment for acne scars, there may be better solution: prevention. Ramesh M et al. “Novel Technology in the Treatment of Acne Scars: The Matrix-tunable Radiofrequency Technology.” J Cutan Aesthet Surg. 2010 May;3(2):97-101. Riveria AE. “Acne scarring: A review and current treatment modalities.” J Am Acad Dermatol 2008;59:659-76. Sardana K et al. “Which Type of Atrophic Acne Scar (Ice-pick, Boxcar, or Rolling) Responds to Nonablative Fractional Laser Therapy?” Dermatol Surg 2014 Jan 21. doi: 10.1111/dsu.12428. [Epub ahead of print]. Zurada JM et al. “Topical treatments for hypertrophic scars.” J Am Acad Dermatol 2006;55:1024-31. It may seem that acne scars are inevitable; however, there are things you can do to reduce your risk of seeing scars when the acne clears. The fewer breakouts you have, the less likely you are to develop acne scars. Severe (painful cysts and nodules) acne: This type of acne is more likely to leave a scar as it clears. Acne that began at a young age: People who develop acne in their preteens often develop severe acne within few years. Dermatologists recommend that a preteen who has acne receive a dermatologic exam. Treating the acne before it becomes severe has benefits, including less risk of developing acne scars. Blood relatives who have acne scars: The tendency to develop acne scars often runs in the family. No results with acne treatments that you can buy without a prescription: A dermatologist can help you find effective treatment for your acne. To keep your skin blemish free, dermatologists recommend continuing acne treatment. Most people can taper their treatment so that they use 1 product a few times per week. A dermatologist can tell you when you can stop treating your skin. Picking, popping, and squeezing can turn a minor breakout into a major problem — a permanent acne scar. When acne flares, many people scrub their skin clean. Scrubbing your skin tends to worsen acne. The worse acne gets, the greater your chance of seeing permanent scars when the acne clears. Lee DH et al. “Comparison of a 585-nm pulsed dye laser and a 1064-nm Nd:YAG laser for the treatment of acne scars: A randomized split-face clinical study.” J Am Acad Dermatol 2009; 60:801-7.